Precision Machining | Tri-Mack Custom Plastics Manufacturing Co.
Tri-Mack’s extensive capabilities enable us to machine complex shapes while maintaining tight tolerances. With Swiss screw machining, large capacity CNC turning and 5-axis milling, we can support your needs for precision engineering thermoplastic parts and metallic hardware. Bar feeders and auto loaders are used to maximize efficiency and reduce costs. Tsugami and Brown & Sharpe Swiss screw machines are used to produce precision bushings and other small turned components from billets and molded blanks made from Vespel (PI), Torlon (PAI) and Teflon (PTFE). We also produce metallic hardware in materials like titanium, stainless steel and aluminum. These components range from custom bolts to bushings for insert molding. CNC turning centers enable Tri-Mack to machine turned components up to 16” in diameter and 39” long. Our Okumas have dual-spindles and multi-axis capability enabling us to machine complex components in a single operation. This reduces the manufacturing cost while improving part quality. 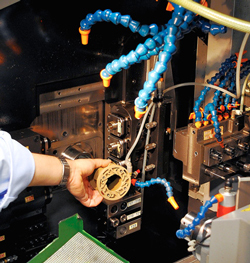 Tri-Mack CNC turns components such as valve seats, pump housings and bearings. These parts are produced from stock shapes and molded near-net blanks in materials like Victrex PEEK, Fortron (PPS) and Meldin (PI). 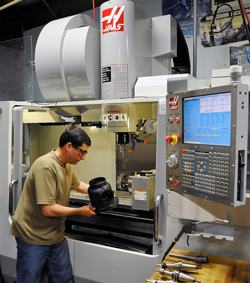 Tri-Mack uses CNC milling to produce prototype and production hardware in engineering thermoplastics like Victrex PEEK, Ultem (PEI) and Nylon (PA) as well as aluminum, stainless steel and titanium. With Haas 5-axis machining and in-machine probing for part inspection, we use the latest technology to produce the highest quality components. From manifolds to electrical covers to brackets, Tri-Mack has the equipment to support your requirements. Tri-Mack uses a Flow CNC Dynamic Waterjet for high speed cutting. A 50,000 psi stream of water combined with fine grit enables us to cut through most materials, but this process is especially effective in cutting continuous fiber reinforced thermoplastic composites. 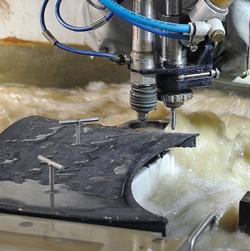 Quick and efficient, waterjet cutting is another tool used to offer our customers cost-effective solutions. Tri-Mack’s machining capabilities further enhance our value as a “one-stop shop,” maximizing our ability to provide you with the best manufacturing process for your product.